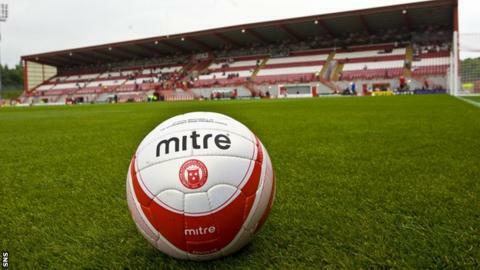 The Scottish FA says it is "surprised" by comments made by PFA Scotland chief executive Fraser Wishart regarding the use of synthetic pitches. It says that the belief that the vast majority of players want to avoid playing on astroturf is misleading. Earlier this week, PFA boss Wishart had called for the SFA to stop allowing clubs to install plastic pitches. "In actual fact, 42.5% of respondents supported the use of synthetic surfaces in competitive matches," said the SFA. "In addition, 52% of respondents supported the use of synthetic surfaces for training on a regular basis." Scottish Premiership clubs Hamilton and Kilmarnock both have plastic pitches installed at their grounds. Wishart had called for an official review into the pitches and said he was not aware of any medical research into the effects of players using synthetic pitches on a regular basis. "All 3G pitches require to be annually certified to FIFA's highest test standard, 2 star, to satisfy SPFL rules on the use of artificial surfaces and the Scottish FA's club licensing process," continued the SFA statement. "Furthermore, 'FIFA 2 Star' is currently in the process of being superseded by the new Fifa quality pro standard, meaning those pitches in operation in the senior game will require to meet even more stringent performance criteria in the future. "The SPFL have also implemented an innovative 'spot-testing' protocol to ensure these standards are maintained throughout the season - the only league in the world to do so. "On the question of available research, a report in the British Medical Journal in 2010, entitled risk of injury on 3G artificial turf in Norwegian professional football, determined no significant difference in injury location, type or severity between turf types: 17.1 injuries per 1000 match hours on natural grass and 17.6 injuries per 1000 match hours on artificial turf. "A similar piece of research in 2007 - comparison of the incidence, nature and cause of injuries sustained on grass and new generation artificial turf by male and female football players. Part 1: match injuries - again showed no major differences. "However, the severity of non-season ending injuries was 7.1 days on (artificial turf) versus 8.4 days on grass."